Sunday's launch of a small eight-sided satellite marked the start of a two-year mission of long-distance exploration to study the little-known boundary between the solar system and the galaxy beyond. The Interstellar Boundary Explorer, or IBEX, rode into space Sunday aboard a Pegasus XL rocket dropped from the belly of an airplane above the Pacific Ocean. The L-1011 carrier aircraft, nicknamed Stargazer, deployed the 50,000-pound rocket at 1:47 p.m. EDT Sunday. The plane was flying about 100 miles north of Kwajalein Atoll in the Marshall Islands. 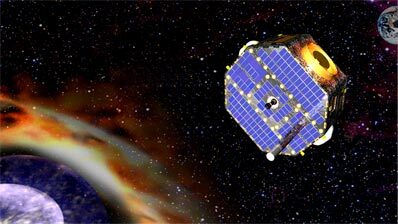 The winged launcher boosted IBEX and a Star 27 kick motor into a temporary parking orbit in the first eight minutes of the mission. The solid-fueled Star 27 fired a few minutes later to boost IBEX to an arcing high-altitude orbit. The satellite was targeting an orbit with a high point of about 127,000 miles and an inclination of 11 degrees. But the 236-pound spacecraft was likely delivered to an even higher orbit than expected, according to David McComas, IBEX principal investigator from the Southwest Research Institute. IBEX will begin using its own hydrazine fuel to climb higher, eventually reaching an orbit with a low point of 4,400 miles and a high point of 200,000 miles, about 80 percent of the distance to the moon. Science activities are expected to begin in about five weeks, officials said. The mission requires that the spacecraft fly outside of the influence of Earth's magnetic field to capture energetic particles from the edge of the solar system. IBEX will observe material from the outer solar system called energetic neutral atoms. These atoms are created by a process called charge exchange, in which charged particles are neutralized by nearby atoms to form the energetic neutral atoms. But the same particles are also produced in Earth's magnetosphere, complicating the mission's design. "We had to find a way to get into an orbit that went far away from the Earth, far outside the Earth's magnetosphere, so that we wouldn't be looking out through this locally-produced cloud," McComas said. A chunk of the mission's $169 million cost went toward purchasing two Star 27 kick motors. One of the devices was used in ground testing and the other was tagged for the launch, McComas said. IBEX officials were responsible for overseeing the development of the unique launch profile. "This mission was possible because the IBEX team designed an ingenious way of delivering a small spacecraft to the orbit required to make these measurements," said Greg Frazier, IBEX mission manager at NASA. The Pegasus is designed to drop off payloads in much lower orbits. "We're going to a couple hundred thousand miles, so 1,000 times higher," McComas said. The work to design the launch came to fruition within 15 minutes of the rocket's deployment. Scientists now plan at least two years of operations to remotely probe the border between the solar system and interstellar space. Hot gas flowing away from the sun at one million mph inflates a giant bubble extending more than 10 billion miles in front of the sun. The bubble is stretched and elongated by pressure from the interstellar medium to form the shape of a teardrop. The solar wind and material from the Milky Way galaxy meet at the heliopause. "It's like the edge of our house," McComas said. "Almost everything inside of there is from the sun. It's the part of space that's carved out by our own sun. Almost everything outside of that heliopause boundary is basically from the rest of the galaxy." Scientists admit they expect many surprises from IBEX data because not much is known about the distant region. NASA's Voyager probes, the first robotic explorers to travel to the outer solar system, passed the solar system's termination shock in 2004 and 2007. The termination shock is the innermost boundary of the solar system just inside the heliopause. Scientists said data returned from the Voyager spacecraft indicated the heliosphere's boundaries may be asymmetrical. "The simple models and theories that we had about that region by and large were not true," McComas said. The Voyager spacecraft provide point observations similar to weather stations on Earth. IBEX will give scientists a global perspective similar to the first weather satellite, officials said. "For the first time, we're going to get the full picture," said Eric Christian, IBEX program scientist at NASA. "We can use the combination of that full picture and the individual weather stations to really make progress in understanding the heliosphere." The heliosphere is an important region because it blocks about 90 percent of dangerous galactic cosmic rays from entering the inner solar system and impacting Earth. The cosmic radiation comes from massive explosions throughout the galaxy. Increased cosmic radiation poses a risk to astronauts on deep space missions and may be tied to bursts in evolution on Earth, McComas said. Recent data indicates the solar wind is slowly decreasing, which could mean the heliosphere is shrinking in size. The heliosphere's size has likely fluctuated since the formation of the solar system due to changes in the solar wind or interstellar space, according to McComas. "At different times, when (the heliosphere) was very compressed, far greater numbers of galactic cosmic rays were undoubtedly able to penetrate into the inner heliosphere," McComas said. A pair of single-pixel imagers will be the key to the ground-breaking mission. The sensors were built by teams from Southwest Research Institute, Los Alamos National Laboratory and Lockheed Martin Corp. The spacecraft will spin at about 4 rpm during the mission, allowing the instruments to paint a narrow swath across the sky. That swath, or crescent, will gradually move across the entire sky during the year as IBEX and Earth move around the sun, McComas said. The sensors will take rudimentary pictures of the sky by imaging energetic neutral atoms flying into the inner solar system from the heliopause. "That particle goes zipping right back in toward the sun, toward the Earth and toward the IBEX spacecraft in high Earth orbit," McComas said. "If (IBEX) was looking in the right direction at the right time and had a big enough sensitivity, it could observe that energetic neural atom." The energetic neutral atom method is the only way to study the outer heliosphere from Earth orbit, McComas said. "What is there can be detected by the very sensitive instruments on IBEX and Voyager and can also affect us," Christian said. IBEX data will produce an all-sky map of the heliopause every six months. Officials expect to create up to four maps during the mission.